KANSAS CITY, Mo. 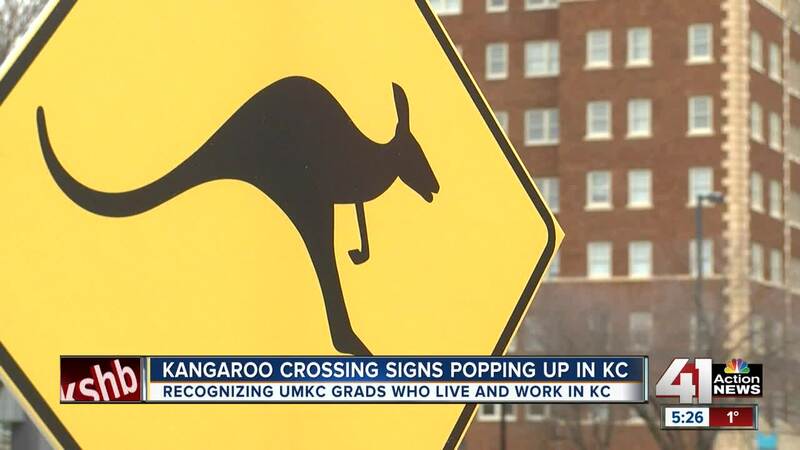 — You see pedestrian crossing signs around Kansas City, and deer crossing signs a little outside of town, but now you’ll see kangaroo crossing signs all over Kansas City. UMKC’s mascot has been Kasey the Kangaroo since 1936. Around that time, the Kansas City Zoo had acquired two baby kangaroos, which became a popular attraction, according to the university's newspaper . Walt Disney designed the first Kasey to appear in the newspaper, after two old friends who were students at the university approached him with the request. Disney had already won an Academy Award for Mickey Mouse at that point, and had a studio in Kansas City near the campus. More than 57,000 UMKC grads work in the Kansas City area. University leaders said the goal of the campaign is to highlight the impact the school and its students have in Kansas City. “I think it's kind of the prophet in your own backyard. Sometimes when you live in a place, you sometimes don't recognize all the great things that are right here in front of you. This campaign is designed to remind people that we have this great university right in our backyard,” said Anne Hartung Spenner, vice chancellor for strategic marketing and communication. The university called this the broadest marketing campaign in its history. Expect to see billboards with a similar message around Kansas City, Topeka and Wichita. Kansas City-based ad agency Bernstein-Rein helped UMKC with the campaign.